Turning to something completely different, Liz has also designed a series of cross-stitch kits based on the tartans of several of the old Scottish clans. These designs combine a clan tartans (most clans now have several tartans) with the clan name and motto. The various designs differ slightly in size, but all measure in the region of 6 inches (or 150 mm) square. These kits combine effectiveness with simplicity - there are no half stitches. All the stitcher has to cope with, therefore, are full cross-stitches and backstitch. All MacPherson Design tartan kits come with Anchor floss (ready sorted on an organiser), 14-count Aida material, a gold-plated needle, and charts and full instructions. Pictured on the right is the Hunting Macleod kit. The pictures shown below are all small and highly compressed. To get a better impression of a design, click on its picture and a larger, clearer one should appear. Gunn, Lamont, MacDonald, MacDougall, MacGregor, MacKenzie, MacKinnon, MacLaren, MacLean, MacLennan, MacNab and MacNeil. MacPherson, MacRae (green and red), Morrison, Murray, Nisbet, Robertson, Scott, Sinclair, Stewart, Urquhart and Wallace. 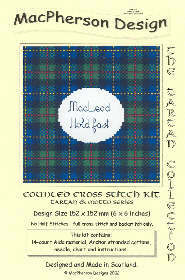 The Crest Cross Stitch pages feature designs by George Copland in which tartans are incorporated into Clan Crests. queries or points directly with us, we suggest that you use our Feedback Form. All needlecraft designs on this page © MacPherson Designs.